As the clock struck midnight last Sunday, Grand Junction night owls saw red–literally. 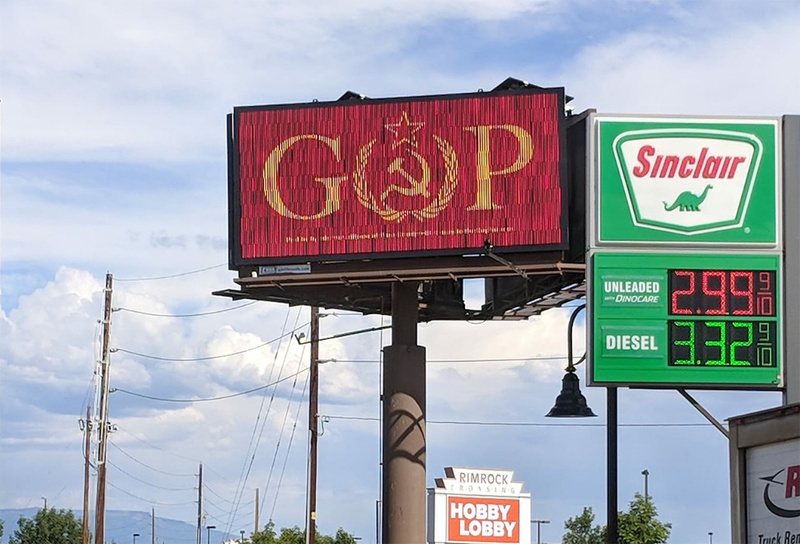 The digital billboard looming over Rimrock Marketplace now displays a massive crimson and yellow “GOP,” but with the “O” replaced by the Russian hammer & sickle icon used by the former Soviet Union. Mesa County progressives purchased the billboard to call out the Republican Party’s refusal to challenge Trump’s apparent preference for Russian denials of election interference over the unanimous assessment of United States intelligence agencies. The fine print on the board reads “Paid for by informed citizens of Mesa County and Mad Dog Pac.” Landman says the “informed citizens” aren’t an official group of any sort, but rather friends and like-minded Mesa County residents. The Grand Junction billboard isn’t targeted at a specific elected official, but rather focuses on the Russia-friendly attitude of the Republican Party. Furthermore, it reflects the sentiments of Mesa County progressives who are decidedly outnumbered, according to Landman. Landman paid for the first week herself and has since solicited donations via her Facebook page to extend the billboard rental beyond July 28. As of Tuesday evening, Landman says she has already collected more than the required $265 for a second week’s rental fee. Good for Anne. If anyone would have the cajones to put that up in GJ, it would be Anne. She has long been one of the most powerful and enduring progressive voices in our community. She gets a big "attagirl" from this dugout. Yes, it is that kind of town. Does the sign remain undamaged?